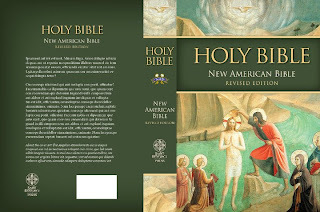 You can help Saint Benedict Press select a cover for their upcoming NABRE paperback releases at their Facebook site. The one I picked is here on the left, which is "The Baptism of Christ" by Fra Angelico. You can also choose from the "Disputation of the Holy Sacrament" by Raphael and "Pentecost" by Titian. No matter which one you choose, they are all quite beautiful and befitting of a Catholic Bible. So bravo, once again, to the fine people at Saint Benedict Press! The NABRE will be released on March 9. The colors work best on this cover, but the red one ("Pentecost") got my vote. I agree that they're all very nice looking covers. For those unfamiliar with the quality of Saint Benedict Press's work, I think it must be said that SBP only works with the finest paper and print: no flimsy lightweight covers, but heavy-duty cardstock which lasts for years and years. My copies of "Dark Night of the Soul," "Story of A Soul" and others which I bought four or five years ago still look great despite repeated use. I can very well foresee myself picking up one of these paperbacks to keep in my satchel which I tote to and from the office. Yes, overall I have been very impressed with the quality of product Saint Benedict Press has been releasing over the past couple years. In many ways, they are setting the standard for Catholic Bibles. I just wish their leather bibles were Smyth sewn instead of glued.